Both summertime and wintertime offer a variety of activities that can be done. 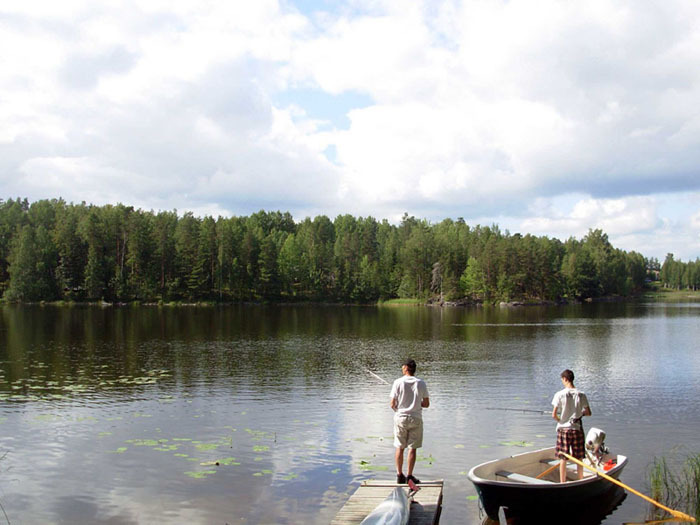 You can look for activities or just relax and enjoy the nature, silence and the sauna. Visiting Hirvim�ki in summer is different from a visit in winter time. In summer you experience the white nights and around the 21st of June there is no darkness during the night at all. The temperature is agreeable and because the days are light you have a lot of time for activities outside. The winter is cold and in the period of Christmas there is daylight from 9.00 a.m. until 15.30 p.m. 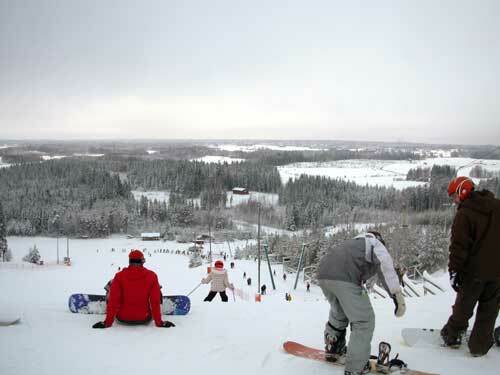 There is a lot of snow and wintertime offers possibilities for typical winter activities. In this time it is important to have a warm winter cottage at your disposal like Hirvim�ki. One of our hiking trips last summer: A hiking track at about 10 km from our cottage. The distance you travel seems not much but due to the swampy features of the track it�s a tough job to make it to the end where you are well rewarded with a cottage, a saw, an axe and firewood to light a fire. The track was made with lots of efforts but the builders have forgotten to tell tourists about this beautiful and rewarding place. Some lucky tourists might even see the beavers in their shelter near the river that runs along the hiking track. Near the cottage you find an Indian canoe for making canoe trips. The possibilities are endless, you can make your own trail beginning with a few hours or a day and maybe a couple of days. With Nordic Everyman�s Rights you can take your tent and camp on the shores of the lake. 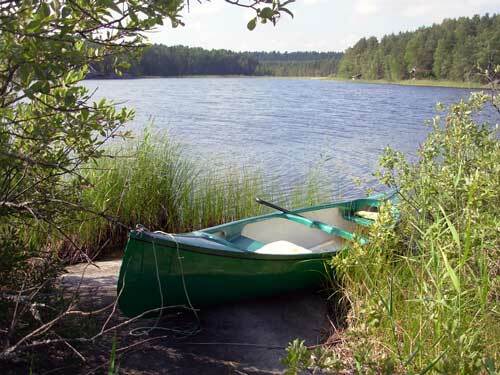 The canoe is stable and suitable for the flat water of the lakes. If you want to follow a nature trail marked with information boards you can try the squirrel route ( oravareitti in Finnish ). This is a canoe trail of 57 km, suitable for family outings. It starts in Juva at the local campsite and ends in Sulkava. Along the trail you find information about the nature and landing stages for pick nick of camping. Canoes and route descriptions are available at the Juva campsite. Here you also can arrange transfer from Sulkava back to Juva if you wish. For more detailed info you find special websites on the links page. The water in the lakes of Finland is crystal-clear. 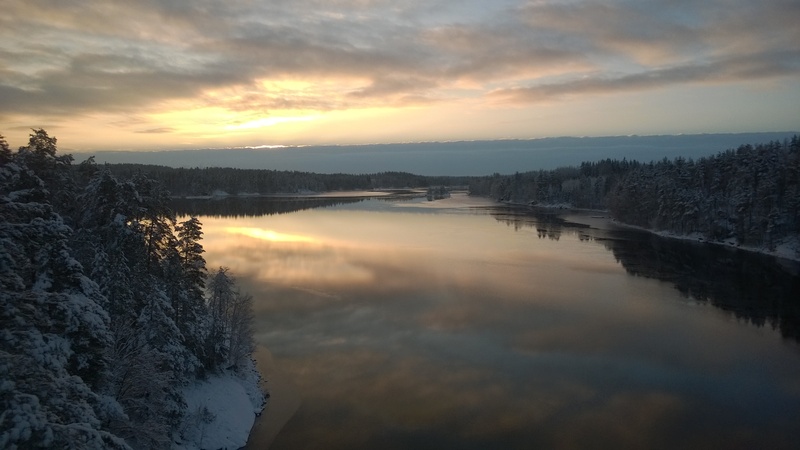 Protection of the environment and the quality of water in the lake is in Finland an important issue. Everywhere the lakes are suitable for swimming. 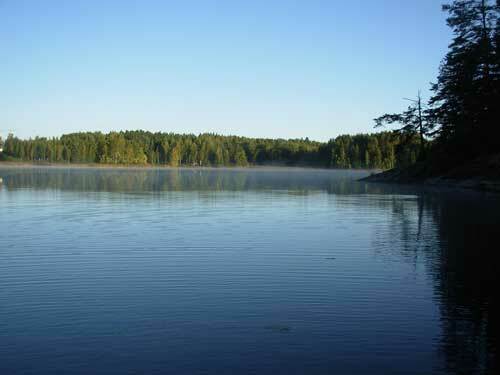 The shore of the lakes can be a sandy beach and shallow water or rocky and steep. At the cottage Hirvim�ki you find a small beach with shallow water. The water temperature depends of the weather. In a warm period the temperature of the water is warm enough to go for a swim. 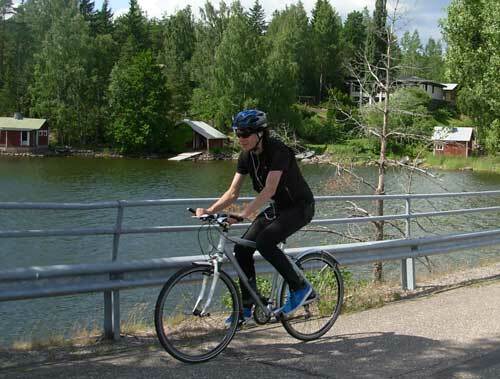 Many Finns are not fond of cycling, although the country is suitable for cycling tours. 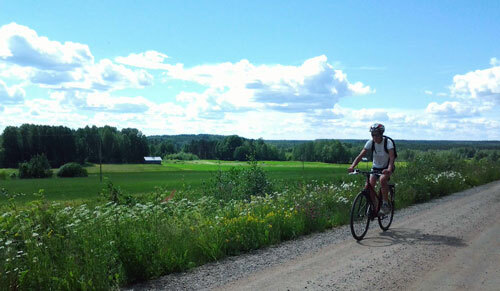 A bicycle tour is a nice way to discover the Finnish scenery from the land. The hills are not high but numerous and sometimes steep, so suitable gear are necessary on the bike. Roads are asphalt roads or the small roads a mix of clay and gravel. The small roads are more attractive for cycling because of the little traffic and the beautiful scenery they lead you. For your safety you must be careful for steep downhill riding because numerous deep holes in the road surface and sharp bends. The use of a helmet is usual in Finland. The tick tyres of mountain bikes are most suitable for these roads. At Hostel Mansikka mountain bikes are available. 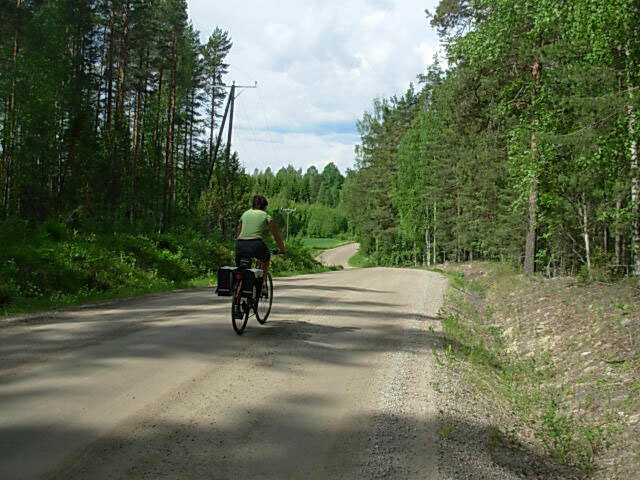 An idea for a daytrip: From the cottage Hirvimäki go left on the Toijantie and follow the road until the end. On the asphalt road to the right, over the bridge and then the first road to the left ( an asphalt road). Keep following this road, the asphalt stops and the road surface will be bad and getting worse. Keep following the road until it ends. You are at the end of the peninsula and the place is called P�ih�niemi. Leave your bike and follow a little footpath left into the forest. 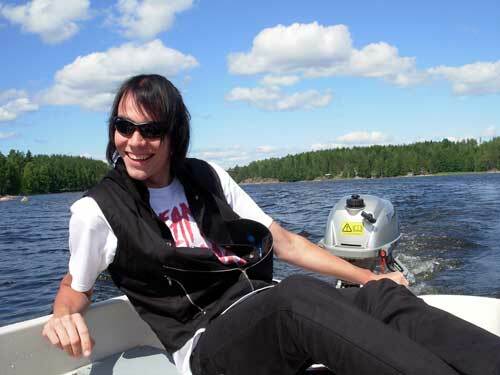 It will lead you to a nice pick nick place and a beautiful beach with a magnificent view over the lake Saimaa. Mostly you are alone on this beautiful spot. Don�t forget to take your swimming bag. 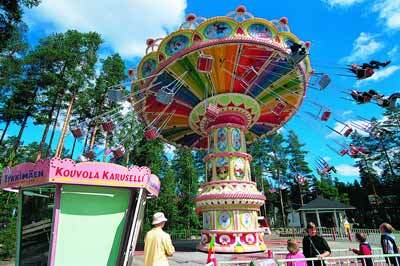 In Finland you find a number of amusement parks and one of them on a reasonable distance for a one day visit. 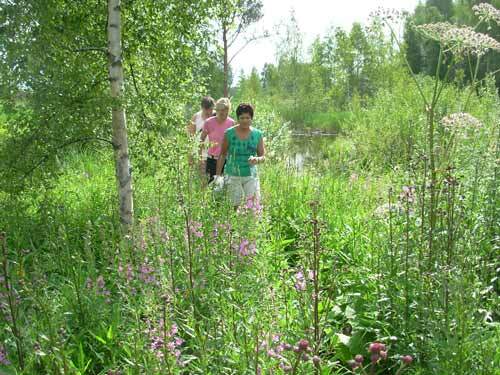 The park is called Tykkim�ki and is located near Kouvola. 85 km south west of Lappeenranta on road nr 6. You can find the website of Tykkim�ki on the links page. In summertime a big sandcastle is built close to the marina and Fortress of Lappeenranta. In Finnish sandcastle is: Hiekkalinna. 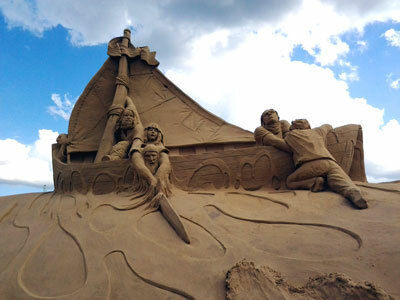 It is the largest sandcastle of Scandinavia and admission is free. The sandcastle is different every summer but always a magnificent peace of sand art. This summer the theme is "Fairy tales". For the sport fisherman this country is a paradise. The lakes are full of fish, and fishing is possible from a boat or shore. A rowing boat is available at the cottage. The most common species are pike, perch and roach. In Finland fishing is very popular and you find fishing stuff in any supermarket or petrol station. In wintertime you see a lot of fishing. Fisherman drill holes in the ice and catches the fish under the ice. 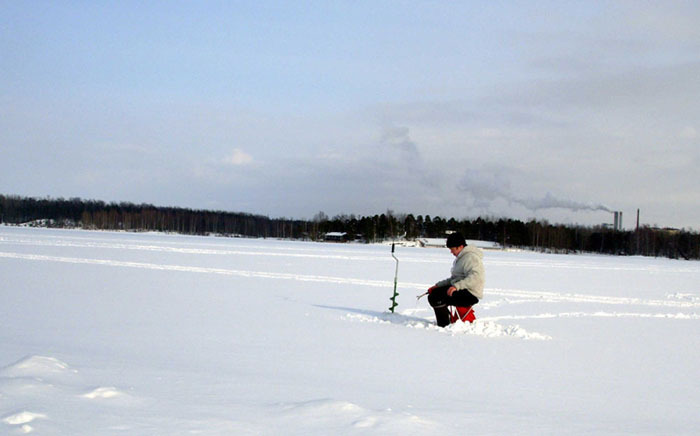 Ice fishing is very popular in Finland and in winter you can see a lot of fishermen sitting on the plains of snow and ice, well protected against the cold wind by their clothing. A lot of fish can be caught this way. It is said that success depends of the position of the moon. 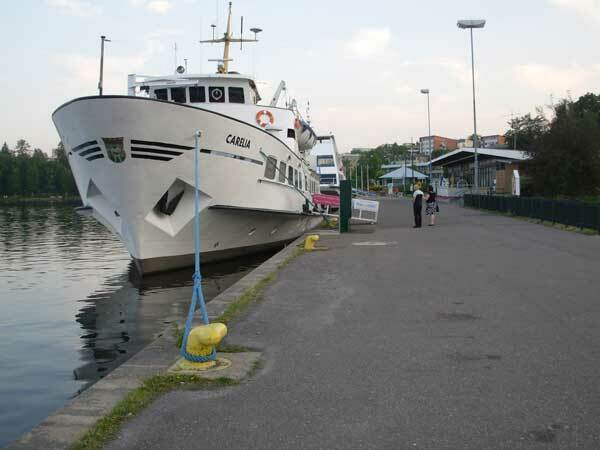 A nice trip for a few hours is a boat excursion on the Saimaa Canal with one of the ships in the harbour of Lappeenranta waiting for passengers for example ms Camilla. More detailed information you can find on the web site of Visitfinland on the links page. Visit St Petersburg: Russia is nearby and visiting St Petersburg is possible in every season. 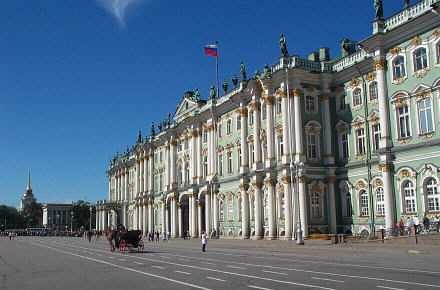 A visit of St Petersburg can be arranged but that excursion will take at least 3 days. For Russia a visa is needed. Hostel Mansikka can arrange visa transfer guide and accommodation during these visits if you want it. It is not possible to take a hiring car over the Russian border, because the car rent companies to not want the risk of loss or damage. A visit to Vyborg ( Viipuri) is possible in a one day excursion. Vyborg is a city on Russian territory but was an important Finnish city when it belonged to Finland before 1939. Finland is the country of cross-country skiers. In summer and winter they are training and on the ski trail you find out how fast they go. There are long distance trails everywhere and near Saimaanharju you find a nice trail with steep parts and it is lighted. At the cottage there is a ski trail leading into the forest. The trail is not often used and the terrain is deserted so it is important that you take a mobile phone and number you can call in case of emergency. The possibilities for downhill skiing are limited. In a town nearby ( Joutseno) you find a skiing hill with a few ski tows. It will not be challenging for the experienced skier but it can be a nice trip for the less experienced skier. You can hire skis, there is light on the ski run, it is not too busy and there is a caf� and the admission is not expensive. In case of low temperature and wind it is important to be protected against the coldness. A snowmobile safari is a exiting activity. It is easy to organise. You ride over the frozen lakes or trough the forests. It is possible to make a trip for a few hours or choose for a long distance and ride the snowmobile for a whole day. Riding a snowmobile is not very difficult but it is rather tiring and a few hours on the machine can be heavy if it is the first time. The ability of a snowmobile is astonishing, it goes down very steep slopes trough trenches much easier that you expect. On the flat surface of the ice speed of 100 km is possible. A motor helmet and thermo overall is part of the equipment of the vehicle. In cold conditions it is especially for the passenger on the back important to be protected. Ice hockey is the most important team sport in Finland. The local team ( Lappeenranta) is called SaiPa and plays in the national league. The results of the games are important sport news. 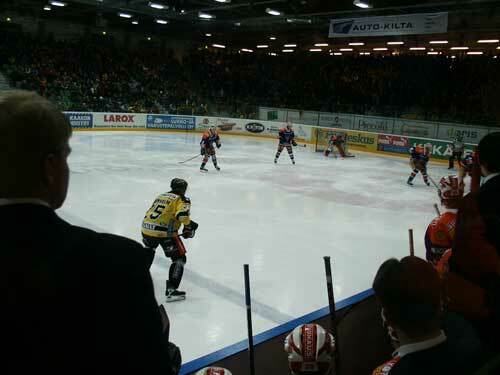 If you are present at one of the games of SaiPa in the Ice hockey stadium of Lappeenranta you experience the sport-loving mentality of the public. Supporters of both teams are mixed in the arena supporting their own favourite without any problem.